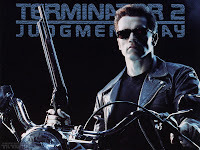 Today I popped in Terminator 2 and then started my Long Cycle set. It was a great combo and really helped me to take my mind off of what I was doing. My body was really arguing with me today about training. I felt very tired mentally and didn't want to practice, but knew I had to. It is what I do. It is part of me. I was not going to let a little fatigue, mental and physical, get the best of me. So I decided to fight back. I forced my body to do what I wanted it to do and what I knew I needed to. My goal of MS does not go away so I cannot either. I think my breaks were shorter today too cause I wanted to get through everything which definitely was good for progress. The Terminator proved to be beneficial in getting me through my suffering. I'll be back! Guerrilla Sprints (4 min. 6.3mph @ 1% incline warm-up, 8x20sec. on/ 10sec off @ 10mph and 2.5% incline, 4 min. 6.3mph @ 2.5% incline.) Total was 12 min.